Kaos Softwear Silicone Hollow Plugs are made from biocompatible medical grade silicone and feature a smooth, solid front with a hollow center and open back. 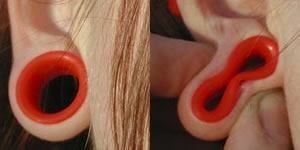 These premium silicone plugs are a great alternative choice for stretched piercings for those with sensitive skin or metal allergies and they feel nearly weightless, providing all day comfort during prolonged wear. The Kaos Silicone Hollow Plug is available in 0g up to 3/4” with a wearable area of 3/8”. This listing is for the Kaos Silicone Hollow Plug in White Leopard Print and is priced per one; please check out for Quantity 2 if you would like a pair.